For one short week last year, we received two garlic scapes in our CSA box. When I first plucked the long, curly, green, and tender vegetable out of the box, I was perplexed. To the internet I went to do some research! I decided to make garlic scape buttermilk biscuits and they were fan-freaking-tastic. I was hoping for more scapes the rest of the season but they never came (the farm had absolutely no shortage of cucumbers, I had cucumbers coming out of my ears all summer long, if only they could have replaced some of those with garlic scapes). A few weeks after that first glorious experience, I saw some garlic scapes at the grocery store and grabbed a bunch. They were disgusting and nothing like what I remembered. They were really woody and fibrous, I could barely chew through them. I later learned that it was because they were too old. I've been waiting all year for them to appear again, and thankfully I found them in droves at the farmers market last weekend. 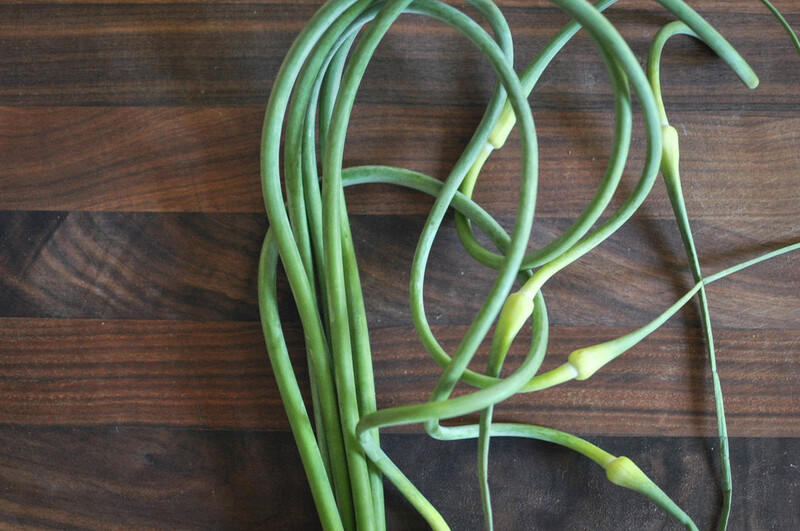 Get younger garlic scapes that are more tender and less firm. Older ones tend to have a much longer section at the base that's woody, fibrous, and not enjoyable to eat. 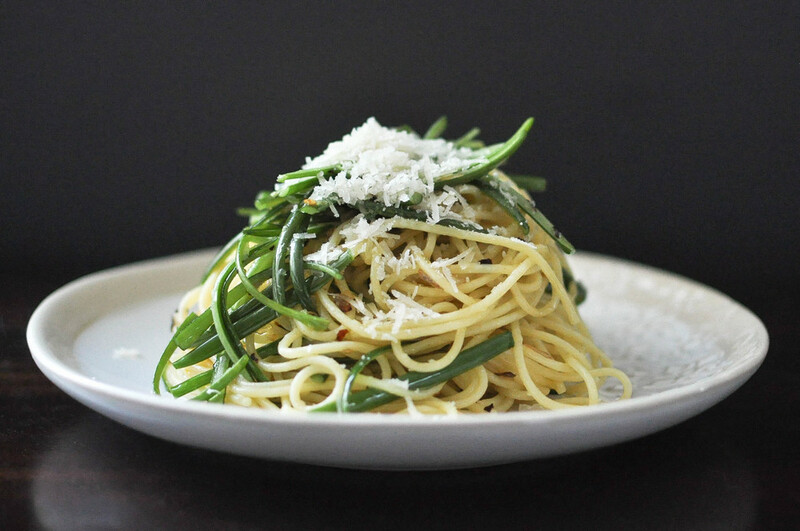 This recipe calls for julienning garlic scapes (in the hopes of making them more "spaghetti-like" so they blend in better), but alternatively, you could just cut them into 1/4 inch cross sections, it's much faster that way. Bring a large pot of well salted water to a boil. Cook the spaghetti until al dente. 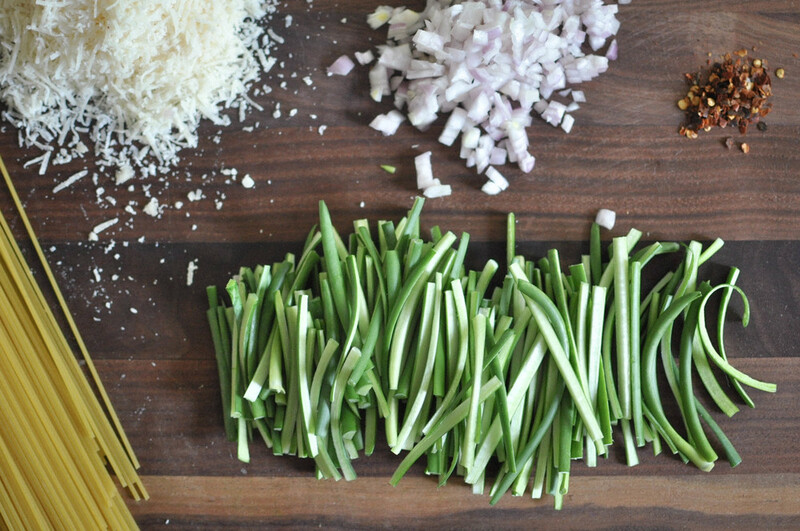 Reserve 1/4 cup of pasta cooking water, drain and set aside while you prepare the scapes. Return the pot to the stove and heat up on medium high. Add olive oil, shallots, and red pepper flakes. Cook for 1 to 2 minutes until translucent. Add garlic scapes and reserved pasta water (the steam makes them more tender than frying in oil alone) and cook for 2 to 3 minutes until tender and most of the water has evaporated. Salt and pepper to taste, add spaghetti and toss to combine. Divide pasta between two plates, top generously with grated parmesan, and serve.